Now, whether you know it or not, this is a controversial one. In the sense that, some folks believe this version was not at all recorded during the actual live show held somewhere in 1978 in Glasgow (and several dates at that); rather, they think it may be just an alternate version from some takes made in the studio at the time of recording studio album “Let There Be Rock”. Whether or not you believe this to be true – I am personally in between: sometimes it sounds like it could be true, but there are other elements that still intrigue me: audience is cheering “Angus” with a tempo that goes with Phil’s hi-hat; Bon seems to be speaking to an audience and sings like he would typically be in front of an audience; the solo is also very energetic in line with other solos of that live album. However, I do agree that the general sound could also be referred to Let There Be Rock. At least one reason for this is certainly due to the recording gear used: Neumann U47 FET for guitars and mixed most likely on a Neve console at Albert Studios – I chose a sound chain as pictured in the relative image. From the picture it is impossible to determine the precise order of the gear used (and a different order will sound different), so let me briefly mention it. 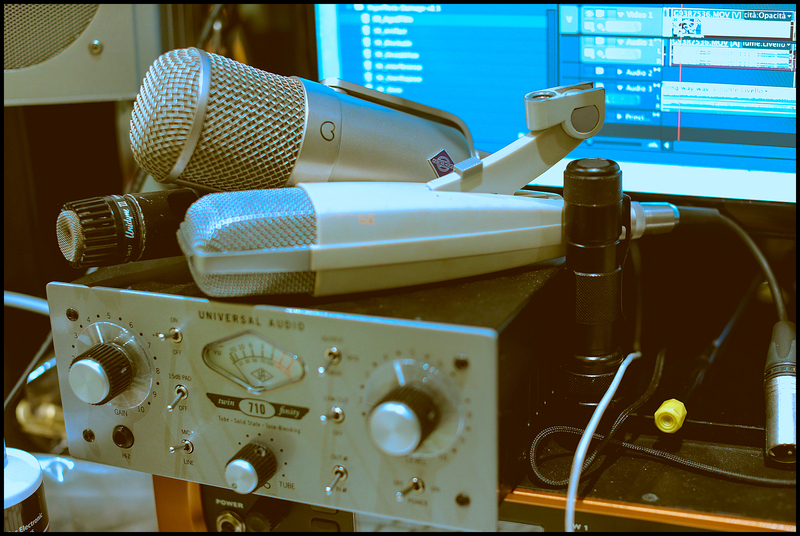 I used the incredible, new Universal Audio Neve 1073 pre/EQ plugin as the first plugin right after the microphone and my Universal Audio 710 preamp (in the other picture with the Neumann U47 FET and an SM57 and Sennheiser MD421). In using it as the first element of the chain (after the hardware one that is) I tried to imprint a specific character to the sound: the character of a Neve 1073 Pre/EQ module. Such character – if you were curious – is very clearly perceivable (for example) from “Let There Be Rock” studio album guitars. Both Rhythm and solos on both guitars of that album used – in fact – extreme preamp levels on the Neve console used for tracking and much likely, mixing that album (remember? We talked about it here). I am almost positive that this was exactly the intention of the Young & Vanda production team. That is precisely the sound of a Neve 1073 Pre/EQ module brought to its extremes and that is pretty much the sonic character that Universal Audio was able to emulate (how? By painstakingly replicating every single circuit and electric/electronic component of such module in software form thanks to mathematic algorithms; these are so much CPU intensive that Universal Audio plugins require their own hardware in the form of UAD-2 DPS Accelerators). 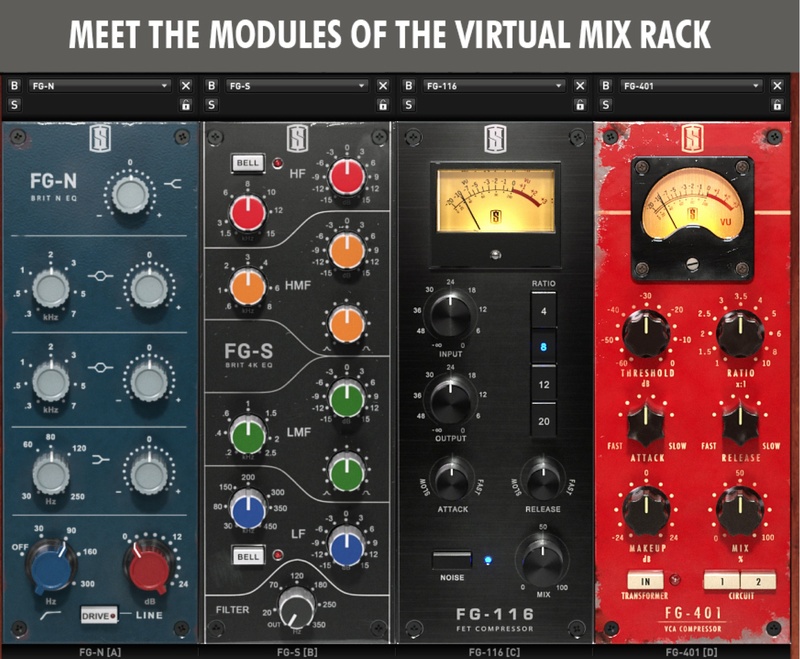 There are several alternatives to Universal Audio – Waves, for example, which won’t require external hardware – or even another one of my favourites, Slate Digital (which doesn’t have a 1073 Pre/EQ yet – will be there in a few months with one of their future release of Virtual Mix Rack – see image). 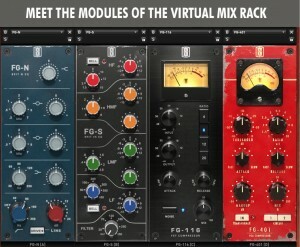 Slate Digital “Virtual Mix Rack” will certainly be among my plugins the moment it comes out. 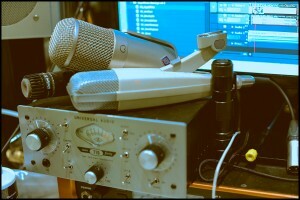 To the left, “FG-N” stands in for Neve 1073. Of course, emulating is not the same (or not yet that is) as having the real deal thing, however I presume that in a few years from now, there won’t be any more difference – not sonically at least. For now, such differences are at times still audible, especially in the form of high treble frequencies that appear smoother with real analog quality hardware and “saw-tooth-like” with digital emulation. 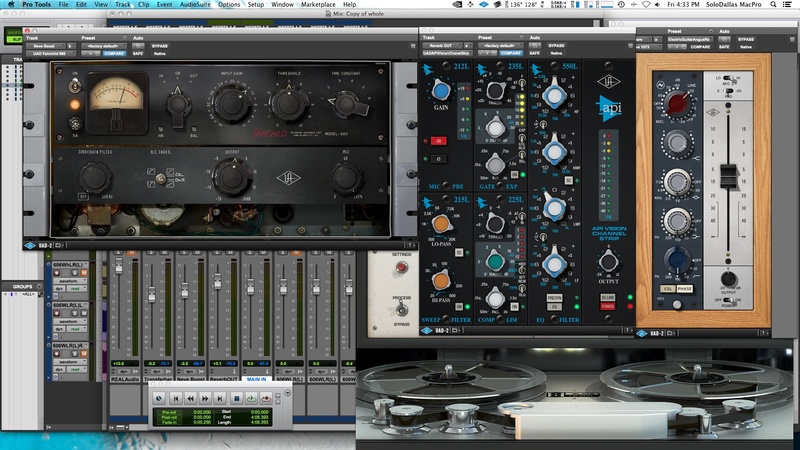 Since buying a Neve console is for me out of the question – and a single Neve 1073 Pre/EQ module is – alone – around USD 3k – I will pass for now (also because, these would be really useful only for early AC/DC – later they changed and used different consoles, outboard, … ). So for our purpose of trying to match one single guitar within the original studio or live sound framework, something like these emulations are completely satisfying for bedroom rockers like us. 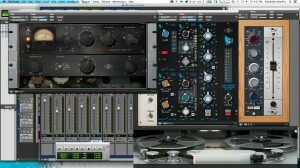 And naturally, they even come at a price: Universal Audio hardware is not cheap – but the plugins are generally affordable in the range of 100-300 USD per plugin (depending on novelty, brand, function etc.). Just as for Powerage (and much likely, for Let There Be Rock) the microphone used here was the great Neumann U47 FET. This microphone is so punchy that it’s astonishing. It’s really got its own sonic character and on guitars, it’s just fantastic. No wonder it was used repeatedly for years from the Young & Vanda team and from countless other sound engineers and producers. It just kicks. It also has a very three-dimensional character, which I am sure you will notice. Clarity is also one of its qualities. Oh the tone……. You nailed it again Fil. Tone so deep it moves you. That wooden box tone, i gotta have it !!!! Im acquiring gear at the moment, running a TSL through a stack of VS412 that sound better than anything ive ever had, but im not there yet. In the market for a YJM and some 60’s cabs and waiting on my pedal. That should put me right on the door of the holy gail. Schaffer pedal on Guitar rig 5! Works very good. Did some EQ here, and the last soloing was a bit impro cause I dind’t had the discipline to learn it :D.
And here is some noodling on a Marshall 2203 ! Quick recording with mobile phone, the amp was at talk volume with the Aracom. That tone was spot on!!!! Nicely done!! can you share the settings? 😀 love to have a go with it! I second Ant’s request. If you could share those settings it would be amazing. I would absolutely love to rock out that entire album with that tone you have sir. This one is definitely not [entirely, if at all, live]. If you listen to Mal, Phil, and Cliff, it is absolutely lifted from the album version and sped up with a higher pitch. Mal has that same “wooden box” tone rather than the brash Powerage tour tone. Angus’ tone in the solo also sounds different from the rest of it. Not sure about Bon though. Either way, great cover as usual Fil! Always a pleasure to watch. Always had a feeling that they did “something” on this Live Album. Love it anyway!!! Let There Be Rock “THE MOVIE” i guess is a more honest live recording of Bon era AC-DC. Yea Another great one Fil!!! Good points. Malcolms track is definitely studio. At the time of powerage, he almost never played the complete riff during the solo live. If you listen closely to live recordings around 78 he ‘simplified’ the rhythm a bit, as he plays the the open D5 instead of the bar D5 followed by a single C note before the A chord, all tied together. You can hear it on the rock goes to college concert, also on the Nashville one. Yeah, Mal did that interchangeably with the power chord variants throughout the Powerage and Highway to Hell (see: Armhend from Plug Me In) tour. He stopped doing it by time the Back in Black tour rolled around though – wonder why. You can not only hear it on Rock Goes To College but it is also highly visible. But whatever he plays, it all sounds cool. Huge part of their drive are the drums ( snare ) and the pumping bass, strictly downstrokes. Great job!! and yeah it’s hard to say but the audience parts and Bon do sound like they are apart and have a different vibe from what Angus did so maybe it’s one track from one show and Angus from another or maybe some of the parts where recorded after or overlaid after when mixing the album who knows. Fantastic playing and sound, that is going to a new level again! Fil,are you going to bring the High Voltage ,Long way to the top, and BIB (from Largo’81) across to premium content that are posted on You tube,for everyone here to enjoy?